Every mother can relate to the feeling that it seems like yesterday when their baby was born and suddenly it is time for the child to go to school. In a fast world where both parents work, starting school or daycare is a difficult time of transition for both the mother and child. The mother is filled with guilt in sending her tiny baby off to school and a feeling of loneliness creeps in as she sees the child in tears peeping through the window and desperately hoping for his/her parent to come back. For the child, it is almost as if the parents have left him/her alone in a lion’s den. New faces, a new environment, sometimes even a new language for families who speak a different language at home add to the confusion. My two and a half year old just started going to daycare this week. It has been such a different experience for me and my child. Since there was no space for him in the toddler group, I had to put him in pre-school the first day, where he had to sit with kids older than him. The curriculum was tougher for the preschooler with handwriting practice and reading books on nocturnal animals! Well, my child was terrified the first day and he cried himself to sleep. He did not understand the older kids, he didn’t even know how to hold a pencil and “nocturnal” was too much for him! When my husband and I (I had taken off from work that day and was hovering around all day in a nearby building) went over to join him for lunch, he was sleeping and his face was smudged in tears. I had to control myself from starting to bawl! However, the next day, the director of the school called me up and said that since my son was too little for pre-school, she had managed to get a spot for him in the toddler room. He could move to the toddler room where the learning was more play oriented and kids were of his age. I almost shouted in joy. It has just been a week and now my son loves going to school. Parents can ease these fears for themselves and for the children by slowly preparing the child for school. These days we are required to register well ahead of time owing to demand and lack of space in schools. A month before the child is due to begin; parents can talk to the child about school. About how there will be toys, activities, how the teachers will take care of them and how they will make new friends. Repetition is a wonderful way of preparing children. They warm up to ideas that are repeated to them. 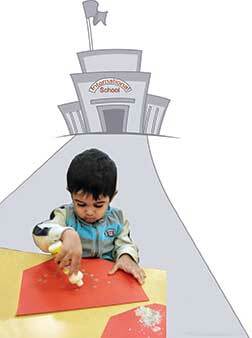 Pretend play is another way where parents or grandparents can play school at home. They can start with how the child would wake up early, dress for school, help mommies pack their lunch bags, put on shoes and then get on the bus to school. These kind of pretend play sessions excite 2-3 year olds. When the real day arrives, the routine is not so new to them. We can even draw pictures of what school looks like and paint a picture of the child sitting or playing in class. This can be put up in the child’s room at home. Shopping for school with the child also helps. Children could help choose their lunch bags or school bags with their favorite animals on them. They could also help set out the clothes they would wear to school the next morning before they go to bed so that they fall asleep with a sense of anticipation. Pack a familiar, favorite lunch or snack for the child. Plan on something he/she loves to eat at home so that he/she feels comfortable when his/her lunch pack is opened. Since schools these days allow parents to tour them before registering, visit the classrooms with the child. If the school allows it, let them play with the toys there and watch the other children play and enjoy themselves. Mothers can perhaps make two or three visits like this so that the child understands what school actually looks like. On the D-Day parents should not seem very anxious since children can read such clues easily. Try to take time off from work and stay with the child till he/she gets comfortable. Never sneak out without letting your child know. Explain that mommy or daddy will be working and will be back in the evening to pick them up. You can plant a kiss on the child’s palm and ask him/her to hold it till you come back in the evening. Sometimes it helps for the child to take a favourite stuffed toy or animal to comfort him/her when he/she gets lonely during the day. Once the first week is past with the same routine (children thrive on routine) the child gets comfortable and understands that the way office is a place for mommy and daddy, school is a place for him/her to have fun, learn, and find friends. The author works in Boston for the health care sector as a QA analyst. She occasionally writes poetry and loves nature. She blogs at srividc.blogspot.com and can be reached at srividhya.chandrasekar@gmail.com.